The first follower transforms a "lone nut" into a leader. He gives everybody else a social proof that they can trust the leader. Then the early adopters join and the movement rolls forward. In modern times we are often over glorifying leadership. No doubts it's important. Key even. But as we see in the "first follower" example - being an early follower is also a kind of leadership. Because often late majority are following the early adopters, not the leader. It also takes guts to be the first follower. To take the risk and support "the lone nut". Not everyone should be a leader. You can support a leader. Be the first follower. Together you can reach success. 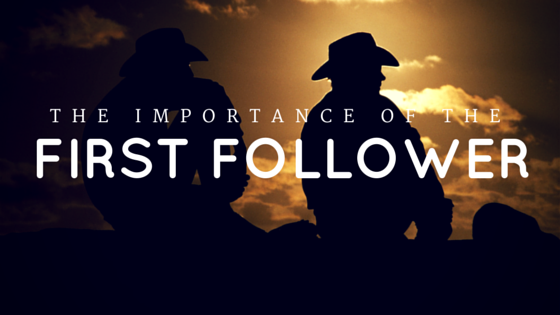 The role of a first follower is the key to a movement as well as for your product. Have you seen any successful product developed by a single person? I'd bet the answer is no. For the same reason, we rarely see a successful startup with a solo founder. Similarly, in big companies, it also takes two and more to make a change. If you're a leader (or wannabe one) - you need an ally. You need your first follower. The receipt for getting the best first follower is pretty much similar to getting a co-founder for a startup. You need a person who shares your vision. You need a person who leverages your weak points with his strong ones. Technical founder and marketing founder. Sales founder and scientific founder. The Same approach applies to a corporate world. When you develop a product in a big company you usually have a product manager in charge. PM could (should) be a leader. But she needs a first follower to truly lead. Best first follower for a PM is either a technical lead or a sales lead. First knows best how to realize a product vision. While second is in touch with customers constantly. The first follower both in a corporate and in a startup worlds adds credibility to a leader and empowers him to achieve shared success. The concept of the first follower also applicable for a process of getting customers. Anybody who tried to sell anything would tell - the most difficult to get your first customer. To get a second one is half as difficult. The first follower to your first customer usually provides you with a much-needed validation of your product, your sales process, and your value. The first follower also allows you to compare. If you have only one customer you can't compare. But when you have two it becomes possible. And such comparison can help you to figure out pricing strategy, delivery strategy, and support strategy. You'd argue that having two is not enough for drawing any serious conclusions? While I would say that to have two is still 1000 times better than have only one. A leader is important. A leader has the guts to stand up and show "the way". The first follower sometimes even more important than a leader. The first follower transforms a "lone nut" into a leader. A leader needs to embrace the first followers as equal. A leader needs a first follower to achieve success.